Zhong Xue Chao, (Master Bing) ,Taoist style Shihao. He is considered as disciple of the 15th generation of Wudang San Feng Kung Fu When he was 6 years old, he has been trained Kung Fu basic skill by his uncle Master Zhong Yun Long, Due to his keen interest in Kung Fu, he has been in Wudang Mount after his graduation from junior school and apprenticed Master Zhong Yunlong to learn Wudang Kung Fu since September 1992. Under the guidance of those respected masters, he was able to learn the original Wudang Kung Fu of many sects such as Eight Diagram School (Bagua Pai), Taiji School (Taiji Pai), Eight Immortal School (Baxian Pai), Form-and-Will School (Xingyi Pai), Eight Extreme School (Baji Pai), Xuanwu School (Xuanwu Pai), Wudang Taoism Regime and so on. In September 1995, he was selected as one of the first members in Wushu Exhibition Troupe of Wudang Taoism Association. In March 1996, he began to work as a coach in Wudang Taoism Wushu Academy . In December, he went to Singapore , along with Wudang Wushu Delegation to spread Wudang Wushu. In October 1997, he got the first prize in the Traditional Wushu Contest in the First Session of Wudang Wushu and Cultural Festival. At the end of this year, he paid a visit to Taiwan Province and did circuit performances in Taiwan along with Wudang Taoist Association Delegation aiming to spread Wudang Wushu. In September 1998, he was chosen as team leader of Wudang Kung Fu Troupe, which was established by Wudang Mount Economical Special Zone to take in charge of the Kung Fu training of team members. In October 2000, he got the championship in the First Session of Wudang Wushu Free-sparring Contest for 65 Kilograms’ Weight. In 2001, on behalf of Wudang Wushu, he was sent to Nanjing to take part in the first get-together of 6 major sets of Chinese Kung Fu, namely, Shaolin, Wudang, Kong Tong, Emei, Huashan, and Lama in Tibet. This is the first event of such kind since 500 years ago, aiming to do volunteer exhibitions for the success of “ Beijing ‘s Bid For Olympics”. In July 2002,at the invitation of “Sino-American Culture Promotion Committee” in New York , he was sent to America to do circuit performances as well as impart Wudang Taoist regime along with the delegation. During his stay there, he was warmly welcomed by the national and state congress members. Meanwhile, on behalf of Wudang Wushu, he did martial arts exchange with the peers from American Shaolin Temple . In December of this year, he went in for the Kung Fu exhibition named “ Wudang Style , Macao Sentiment” in celebration of the third anniversary of Macao ‘s returning to motherland. In January 2003, he was selected as director of Wushu Association in Danjiangkou City of Hubei Province , undertaking the task of studying Wudang Wushu. He was again sent to Taiwan to impart Wudang Wushu. He has also been giving performances to many national leaders such as Li Lanqing, Qiao Shi and so on. Master Zhong Xue Chao or Master Bing moved to the United States in April, 2006 and is living in Southern California for a couple of months a year. 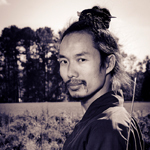 He will visit America to develop Wudang Kung Fu and Tai Chi with private students for couple of years. 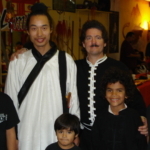 Master Bing has taught seminar’s at the Shaolin Temple of Lomita and will conduct an annual seminar at the school. In Northern China people esteem highly of Shaolin while in Southern China people have much respects to Wudang Kung Fu. All martial arts around the country originated from Shaolin and Wudang. Wudang internal Kung Fu has the characteristics of overcoming toughness with flexibility, hardness with softness, and movements with stillness. It is said that you can even move a stone with a hair. Wudang Kung Fu not only has the functions of body-strengthening and self-defense but also can preserve people’s inner energy.